The Norfolk Specialist Partnership (NSP) is to hand over its work to Community Action Norfolk and Momentum (Norfolk) as charity leaders across the County work more closely together. NSP was made up of specialist organisations in Norfolk, established to support frontline agencies to respond more effectively to the needs of service users, to improve their quality of service design, implementation and delivery and to develop an effective, forward thinking response to the challenges posed by the radical transformation of health and social care services. In 2009 NSP carried out a research project; ‘Getting Personal - Getting Real: The initial impact of the personalisation agenda in Norfolk and the way forward’. The research engaged with service users, health, housing and social care managers and practitioners to gain a unique insight into current views on personalisation and developed models for the transformation of services through the formation of the Centre for Empowering Practice. In the spring of 2015 NSP supported the successful joint voluntary sector infra-structure development bid from the Norfolk Rural Community Council, West Norfolk Voluntary & Community Action and Momentum (Norfolk). 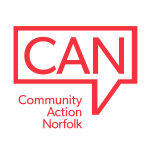 Two of these organisations have merged to form ‘Community Action Norfolk’ who continue to work in close partnership with Momentum (Norfolk). NSP members feel that the time is now right to dissolve the group and work with Community Action Norfolk and Momentum Norfolk to champion service user engagement. Community Action Norfolk and Momentum (Norfolk) have set up a new sector leadership group made up of 15 sector representatives. 10 of these representatives are from specialist sectors such as housing, mental health and young people with a further 5 representatives having been elected at the 'Stronger Together' conference in the summer. work together to overcome the challenges we face'. Cindee Crehan, Chief Executive of Momentum (Norfolk) said; 'We are extremely grateful to NSP members for their legacy of service user empowerment and we are committed to continuing and developing this work'.